Diamonds and graphite are chemically the same yet physically different, just like how two minerals can differ from each other, one hard and translucent and the other soft and opaque. The changing arrangement of carbon atoms provides a unique feature to both diamonds and minerals. Polymorphs, otherwise known as materials containing similar composition but with varied structures, are commonly found in bulk materials. 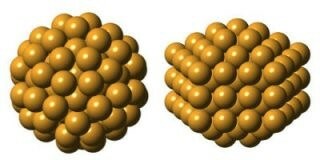 The existence of polymorphs in nanomaterials has been proven by a recent study published in Nature Communications. Researchers explain two novel structures for the iconic gold nanocluster Au144(SR)60, most commonly known as Gold-144. They have also explained an extremely new version that has never been seen before. This invention provides engineers with a new material to be explored and also provides the possibility of detecting various other polymorphic nanoparticles. This took four years to unravel. We weren’t expecting the clusters to take on more than one atomic arrangement. But this discovery gives us more handles to turn when trying to design clusters with new and useful properties. For thousands of years, gold has been utilized in jewelry and coins because of its durability. It is also important to note that gold, when shrunk to a size that is 10,000 times smaller than human hair, becomes extremely unpredictable and unstable. At the nanoscale level, gold tends to disintegrate into other molecules and particles, allowing it to be used as a material for imaging and destroying tumors, purifying water, and enhancing the efficiency of the solar panels, among various other applications. Even though an increasing number of molecules and nanogold particles have been developed in the lab, only a few of these particles have revealed their secret atomic arrangement. These tiny structures are now gaining popularity with the development of new technologies. In one approach, high-energy x-ray beams are discharged at a sample of nanoparticles. Enhanced data analytics are utilized to understand the x-ray scattering data and the structure of the sample, which indeed plays a major role in understanding how durable, reactive, or firm the particles might be. A new technique known as the atomic Pair Distribution Function (PDF) analysis has been developed by Billinge and his lab for understanding this scattering data. Billinge tested the PDF method by requesting chemists at the Colorado State University to develop extremely small samples of Gold-144, which is a molecule-sized nanogold cluster initially isolated in 1995. In 2009, the structure of Gold-144 was theoretically predicted and though this was never confirmed, Gold-144 has many applications which also include tissue-imaging. Assuming that the test would confirm the structure of Gold-144, the researchers examined the clusters at the European Synchrotron Radiation Source in Grenoble, and then used PDF method to understand their structure. The researchers were surprised to find an angular core instead of the predicted sphere-like icosahedral core. The structure regained a spherical form when the researchers developed a new sample and repeated the experiment, but this time they used synchrotrons at Brookhaven and Argonne national laboratories. We didn’t understand what was going on, but digging deeper, we realized we had a polymorph. Additional experiments proved that the cluster had two versions, which were at times found together. Each version had a unique structure highlighting the fact that they act in a very different manner. Researchers are still not sure if Gold-144 is capable of switching from one version to another version. They are also not sure as to what actually differentiates the two forms. The researchers came up with their invention by solving what physicists refer to as the nanostructure inverse problem. The question that arises at this point is, how can we infer the structure of a small nanoparticle in a sample from an x-ray signal, which has been averaged over countless number of particles, each with varied orientations? Our results demonstrate the power of PDF analysis to reveal the structure of very tiny particles. I’ve been trying, off and on, for more than 10 years to get the single-crystal x-ray structure of Gold-144. The presence of polymorphs helps to explain why this molecule has been so resistant to traditional methods. The PDF approach is a rival method similar to other rival methods that have been produced to bring the structure of the nanoparticle into focus. This approach has now proved itself, and hence will help speed up the task of explaining other nanostructures. The aim here is to design nanoparticles based on their desired properties, instead of using a trial and error method, and also by understanding the connection between form and function. It is possible to design new materials with lesser clicks of a mouse by using databases of both predicted and known structures. We've had a structure model for this iconic gold molecule for years and then this study comes along and says the structure is basically right but it's got a doppelgänger. It seemed preposterous, to have two distinct structures that underlie its ubiquity, but this is a beautiful paper that will persuade a lot of people. Other authors who were part of the study include Pavol Juhas, Brookhaven National Laboratory; Marcus Tofanelli and Christine Heinecke, Colorado State; and Gavin Vaughan, European Synchrotron Radiation Facility.